This is a report of a Sierra hike that began at at the Isberg trailhead, and proceeded over Isberg and Red Peak Passes before exiting over Chiquito Pass. I include some notes at the end for those who may be looking for information when planning a similar trip. A map of the trip, as originally planned, is available here. For more information, see my favorite books on the Sierra Nevada. August 17: Having spent the night in Oakhurst, Dan Vandersteen and I got an early start for the winding Beasore Road, and arrived at the pack station at 7 a.m. I’d originally planned on at least two cars so that one could be spotted where we would leave, but we ended up with just two of us. When the packer heard that, he offered to get our car to where we would come out. I had not realized just how lonely this area was, so I happily accepted his offer. We left him with our packs, then headed for the ranger station, where a talkative volunteer provided much helpful information while issuing our wilderness permit. We then had a pleasant nine mile walk up to Sadler Lake. We had a good camp site, not far from three gents who had everything short of the kitchen sink packed up. August 18: I’d originally planned a layover day, but since there were just two of us, we headed up and over Isberg Pass. We took the time to climb 300 feet to the top of the minor peaklet next to the pass, which had a good view. There was also a good view of the Minarets. On the way down the far side of Isberg Pass, we encountered a trail crew, hard at work repairing and improving the trail. We appreciated their efforts, and ended up camping near their base camp along the Triple Peak Fork. There were 13 of them, some under Park Service, some under State of California, supervision. They hike as far as 7-10 miles to get to the day’s work site. On the other hand, they have a cook, great food, and alternating 4 and 5 day work weeks, giving lots of time for their own hikes. I got a tour of the camp, which was extensive, but the head explained to me that after they left in September, it would be hard to tell they had been there. August 19: A pleasant day’s walk to Red Devil Lake. We saw only six people all day. An international group of four was being led by a Sierra guide. One of the trail crew supervisors passed us on the way to another group of his charges. After a navigation error that delayed us a bit, we set up camp by Red Devil Lake, a lovely place that doesn’t seem to be visited very often. August 20: We headed back to the trail, and over Red Peak Pass to Lower Ottaway Lake, a total of only 4-5 miles. It’s a good trail to the pass. There was some snow, but nothing distressing. From the pass, we had a view of the incredible switchbacks on the south side of the pass. Now, I usually groan a bit when facing switchbacks, but these are remarkably well done. They are smooth, with few rocks to stumble over. We dropped 500 feet in perhaps 15 minutes. We met five people on the way down, before finding ourselves the only campers at Lower Ottaway Lake, which lives up to its reputation. August 21: The plan was to reach Moraine Meadows. However, the hiking was remarkably pleasant (Merced Pass hardly deserves the name), and besides that, Moraine Meadows turned out to be soggy and mosquito-infested. We agreed to press on to Chain Lakes. That proved easy, with delightful trail all along the away, until the last annoying climb to the first Chain Lake. Chain Lake had the most prolific supply of firewood I’d ever seen. We felt like we were doing a good deed by burning some of it. We saw no one else that night, though one guy was camped further along the lake. August 22: The stroll down to the Chiquito Pass trail head was quickly done. There were three other cars parked there, and I once again was delighted that the packer had been kind enough to move our car there. It would have been a miserable experience getting back to where we had started. We drove out, spent the night in Lee Vining, and headed back to Reno and the airport. 1. There is decent camping everywhere along the hike. There are at least two good spots at Red Devil Lake, along the eastern shore. Lower Ottaway has numerous good sites as well. We camped on the west side, but there was a use trail on the side closest to Red Peak Pass, which I assume led to sites, though we did not check them out. 2. Being a rather slow hiker, I’d planned to go from Lower Ottaway to Moraine Meadows. 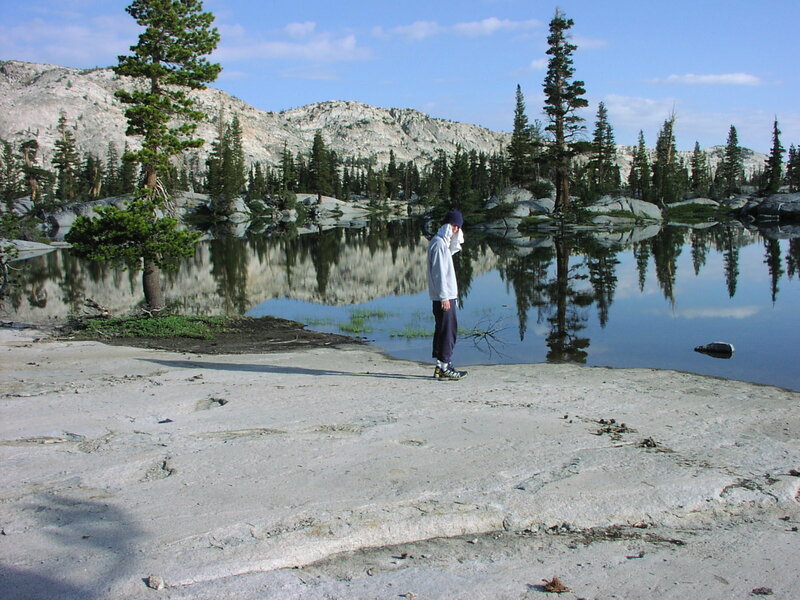 As mentioned above, Moraine Meadows is not a good place to camp, so aim either for the Merced Lakes or Chain Lakes. If you are going downhill, you’ll have no difficulty getting from Lower Ottaway to Chain Lakes in a comfortable day. 3. I do recommend the folk at Minarets Pack Station. In my younger days, I used to sneer at those who took advantage of those mules, but having reached 55, I find that taking the pack off my back the first day does wonders for my morale. And as I mentioned, the packer’s gracious offer to move our car saved us lots of trouble. I probably didn’t tip enough. 4. It really is an infrequently visited area. Don’t count on being able to easily hitchike between trailheads. As of April 1, snow in our part of the Sierra is at 153% of normal. which makes me happy I moved the date back. The moquitoes will have more time to die. This trip provides a little more flexibility than usual. It’s been too long since I had a chance to hike around Tuolumne Meadows in Yosemite, so this trip begins with two days in my favorite place in the world, giving opportunity for a day hike, dinner at the Mobil Gas Station in Lee Vining (if you haven’t dined there, you have missed something), and a leisurely drive through Yosemite before hitting the trailhead. Those short of time or not interested in spending two nights in Yosemite could fly out on August 16. This hike is a bit more work than last summer’s. However, most days have 4-6 miles of actual hiking, so we will have plenty of time to relax in camp after the day’s exertions. This is an area entirely new to me. It’s reputed to be a lovely area, and it’s remote enough so that we will not see many other people. You can check out the map of the route. August 15: Day hike in Tuolumne Meadows. August 16: Morning day hike, leisurely drive through Yosemite to Oakhurst, where we’ll spend the night. August 17: We need to be at the Minarets Pack Station by 7:30. It’s about a 90 minute drive from Oakhurst. The packer will haul our gear to Sadler Lake, about 9 miles and 2,400 feet. It’s a reasonable trail in to Sadler. The Packer tells me the trail crews do it in 3 1/2 hours. We’ll take a little longer. August 18: Layover day at Sadler Lake. We can climb Sadler Peak, or hike around the area. August 19: Hike over Isberg Pass and down to Triple Peak Fork. About 1200 feet up to the pass, and five miles of walking. Isberg Pass is a stiff climb. 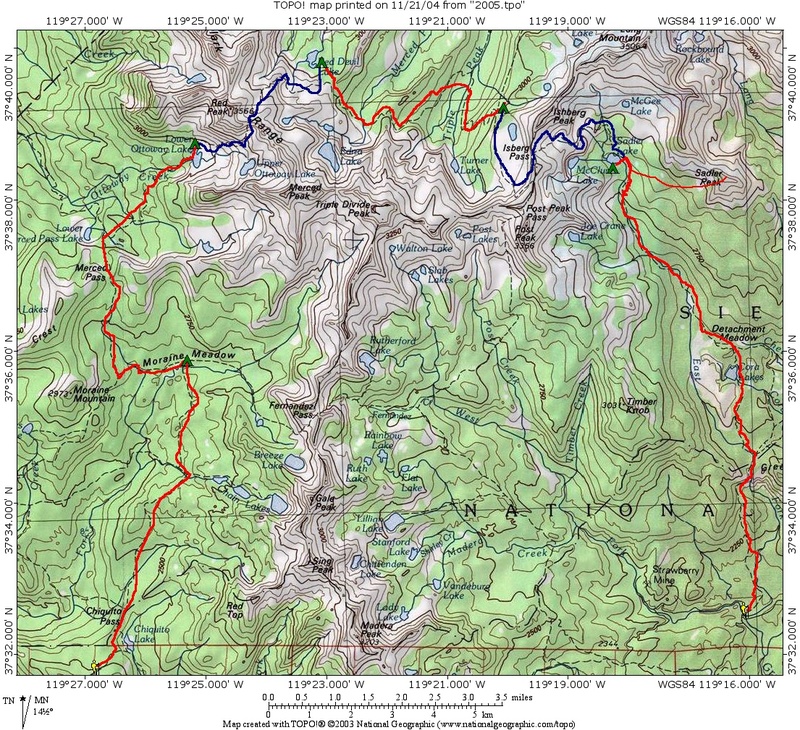 August 20: Hike to Red Devil Lake. About five miles of walking with some ups and downs along the way, but no big pass. August 21: Only about 4 miles today, but it’s over Red Peak Pass, the highest pass in Yosemite. It’s about a 1400 foot climb from Red Devil Lake. We’ll camp at Lower Ottoway Lake. August 22: A generally downhill day, with about a 500 foot rise to Merced Pass, then down to Moraine Meadow. Six miles. August 23: Hike about six miles out, drive to Reno. Celebratory dinner. As always, what we actually do will likely be a bit different. The alternate plan, should we decide that the route over Red Peak Pass is more than we are up for, is to return to the trailhead we started at via Post Peak Pass, which would parallel the trail we come in on, but to the west. Days 3-5 of this hike follow our route, but in reverse. This description basically follows the alternate route outlined above. This one follows our path (in reverse) from Lower Merced Pass Lake to the valley beneath Isberg Pass.